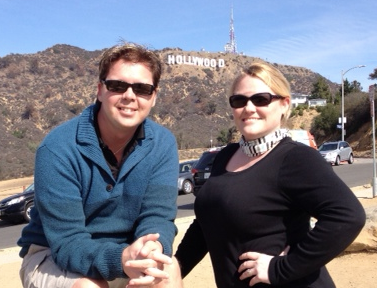 Mikey & Cathy of The Crochet Crowd under the Hollywood Sign in Hollywood. I hook in bed, that’s no secret. It’s when all of my work duties are done for the day and I get to crochet. It’s the best time of the day for me. I had a moment that made me daydream last night. I’m hooking up an afghan that I haven’t yet shown publicly yet. I’m really proud of it. Daniel and I have been watching a series on the Egyptian History on Netflix. As I have said, I have probably heard more TV in my lifetime than I have actually watched as I crochet and glance at the TV. Here I am taking some balls of yarn and making an afghan. An afghan that doesn’t exist in the world and is being created with my own hands. Though i am following an existing pattern, this afghan is for me and is something that I am really excited about. The joy in my hands that will be unleashed when I am done is an addiction high that I love. Here I am watching (more listening) a documentary series about Egypt. My mind is being enriched with knowledge as I am working on my afghan. Riverstone is on my left sleeping at the side of my thigh. Dimitri is sleeping near my feet. Diva Dan is on my right playing Candy Crush. I realized, everything is right in the world. It was a moment to savour. Though I feel stressed most of the time, at this moment… the world was calm, perfect and I am where am meant to be at this time of my life. This entry was posted in Announcements and tagged Crochet, Crowd, Mikey. Bookmark the permalink. Mikey (and Dan), You are so fortunate to find “the perfect time, all is well feeling”! With your harried life, peace and quiet does not come often, I am sure. Enjoy. How wonderful that you were able to recognize what a wonderful thing “life” really is. The things we take most for granted seem to be those that are small in stature but big when it comes to what is meaningful. Few people take the time to notice these important things much less relay them. Hugs enjoy the little things. Isn’t it great when all is nice with the world! It’s the joys in life, as you just described, that make the rest of life tolerable! Never forget or give up on your joy! Yes perfect moments like that. I crochet on the Loveseat in the living room while Keith watches TV with the dog at my feet and the cat wrapped around the back of Keith’s head. Ah, perfect Mikey. Thanks for sharing your special moment. We all need these. THANK YOU MIKEY, YOUR POST BROUGHT THAT TEARY WARM FUZZIES FEELING TO ME AS I WAS READING IT. I AM HOME FIGHTING CANCER AND DOING CHEMO…….I AM IN MY CHAIR ALL DAY CROCHETING UP NEW CREATIONS FROM A PILE OF YARN AND LISTENING TO TV………..WE LOVE THE EDUCATIONAL STUFF AS WELL. WITH EVERYTHING GOING ON IN LIFE IT’S AN INSPIRATION AND A GREAT REMINDER THAT EVEN WHEN LIFE IS PILING UP ON YOU THERE ARE STILL THOSE MOMENTS THAT MAKE IT ALL WORTH IT……………. BEST OF LUCK TO YOU AND YOURS IN EVERYTHING YOU DO ………… KEEP UP THE GREAT WORK AND I WILL KEEP WATCHING AND READING AND LEARNING AND SHARING AS WELL. It is so wonderful to know that you can get down time. I worry that you work so much and have just too much going on. I’m glad to hear that you do get to breath once in a while. I’m glad you got your moment, When I crochet it relaxes me too. Absolutely perfect. But if I crocheted in bed there would be three rooms with yarn in them. That’s a little much to ask my husband to tolerate! Thank you, Mikey. Your post gave me the teary warm fuzzies this morning. It’s an inspiration and a reminder that even when we feel the weight of daily life pressing down on us, there are those few perfect moments that make everything worth while. May you have many, many more. I am so glad you found some peace amidst all the hard work you put in! My heart ached for you a while back when all the negativity was bringing you down. God bless you, Mikey, and Dan and Cathy and Riverstone and Dimitri! Love this .It will turn my day around reading it on this sunday morning.Thank You. You are such a positive inspiration.Have you tried Chi Gong yet? It is a gift to you that you can find that moment of perfect peace and enjoy it. They do not come often, and people seem to shy away from the emotions of it.. but you basked in the glory. Good for you.. and may you be able to do so again, and again, and again as the years go by. Moments like that are priceless, i wish I had more of them. right now im working on a project of my own that is a first for me even though I don’t plan on keeping the end result(it will be used as a give away once my own face book page reaches its 500 likes mark). this project is my very first attempt at doing a graph blanket, and so far it is phenomenal. i swear i have some of the most brilliant ideas at 4 in the morning just before I hit the point of sleep! a “defining” moment! Savour it, relish it! Thank you, Mikey! I’m so glad you got to enjoy your moment. I hope you get many, many more just like it. Can’t wait to see what you’re working on! Those perfect moments are the ones to cherish. Have more. I read your blog posts all the time and I think this is my favorite.